color, cut, clarity and carat. diamond with no color allows maximum light to pass through, colorless diamonds are preferred for their sparkle.Cut refers to a diamonds reflective quality. 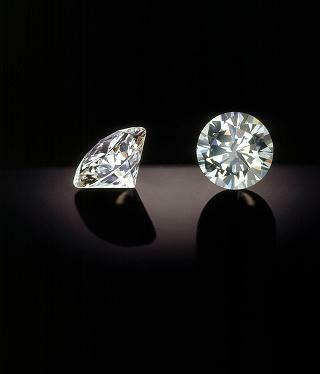 Most diamonds are cut with 58 facets. The brilliance of diamonds is heavily dependent on the cut. The different angles and the finish of a diamond determine its ability to reflect light and cause its brilliance and fire. leak out of the back and the diamond will lose some of the sparkle and appear not to shine. So, as you can see the Cut is probably the most important of the Four C’s. During the formation process, inner flaws, or inclusions occur in most diamonds. The number and size of these inclusions determine what is referred to as the clarity of a diamond. Diamonds that are clear create more brilliance and therefore are rarer and highly priced. To be considered“flawless”, a diamond must have no surface or internal imperfections visible upon being viewed by a skilled diamond grader using 10 power magnifications. informed selection. Knowing the “four C’s” allows you to comparison shop and purchase the best diamond at a fair price. But, before making a purchase, shop around and decide what shapes and styles really appeal to you. Enjoy your diamond for years to come!